Sarens has performed the transport and lift of a 1,022t offshore wind farm jacket cluster for client Burntisland Fabrications (BiFab) in Methil, Scotland. BiFab is manufacturing 26 jacket substructures for the Beatrice Offshore Wind Farm in the North Sea, located off the coast of Scotland. As part of its £100m contract with EPCI contractor Seaway Heavy Lifting, BiFab will deliver the first ten substructures this August and the remainder in April of 2018. For the operation Sarens used a Demag CC9800, a Demag CC8800-1 BB (Boom Booster), two Demag CC2800-1, two Liebherr LR116, a Liebherr LTR1200 and two LTR1100, other telescopic and lattice boom cranes, 60 axles of SPMTs and 6 PPUs. Sarens cranes had been on site since May of 2017. The CC9800 and CC8800-1 were delivered to the site by vessel, offloaded, and rigged on the quayside in their final working positions. For this operation, the team first transported the load 76m, an operation that took four SPMT operators about two hours to complete. With the offshore jacket in the horizontal position at the up-ending location, the Sarens team was ready for the 90m lift. They attached the lifting tackle to the lifting points and removed the lashing so that two main lift cranes, the CC9800 and CC8800-1, could begin hoisting the load up in slow increments, slewing slightly. With the main lift cranes in operation, both tail cranes then began to hoist, slew and track towards the main lift cranes. 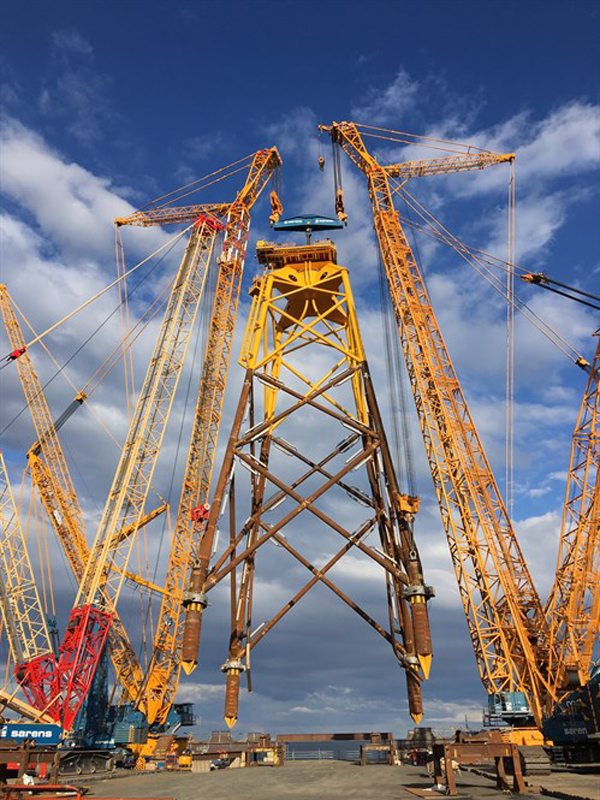 As the offshore jacket became more vertical and the load was transferred onto the main lift cranes, the tail cranes began to slew the offshore jacket into its final position until the load was shared between the main lift cranes. "The greatest challenge during the lifting operation was to coordinate the functioning of the two main lift cranes and two tail cranes," said operations manager Andrew Hunt. It took an hour and a half to up-end the jacket from a horizontal to a vertical position, including twenty minutes for the client to fix brackets to the jacket.